This was a joint exhibition in collaboration with John Christie. 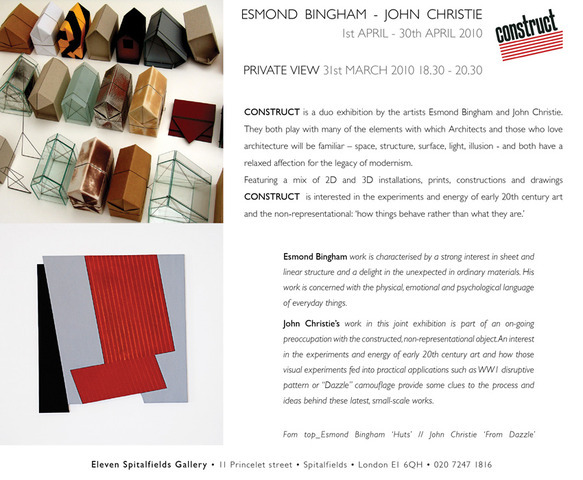 We share an interest in the legacy of the Constructivist tradition and this theme, whilst not implying any slavish homage, may be seen as a backcloth to this exhibition. The gallery context, relating as it does to the adjoining architectural practice, was a further influence on the work chosen. The works by me ranged from free-standing three-dimensional works influenced by architectural models to a variety of paper constructions within wall mounted boxes.